FREMONT, CA – September 2nd 2016 – CORSAIR®, a world leader in enthusiast memory, PC components and high-performance gaming hardware today extended its multi-award winning range of performance PC cases with the release of the new CORSAIR Carbide Air 740. Featuring CORSAIR’s innovative dual-chamber Direct Airflow Path™ design, exceptional cooling capabilities, unique bold design and a stunning tinted, fully removable side windowed panel, the CORSAIR Air 740 offers remarkable cooling performance and the flexibility to handle even the most ambitious enthusiast system builds. 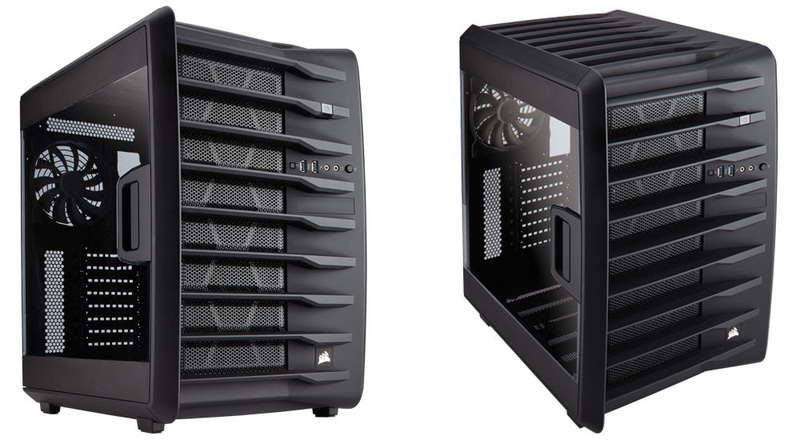 An evolution of the best-selling CORSAIR Carbide Air 540, the Carbide Air 740 takes full advantage of its predecessor’s ground breaking dual-chamber design. Fully utilizing the space within the case, the Air 740 splits the system’s hardware between two compartments. 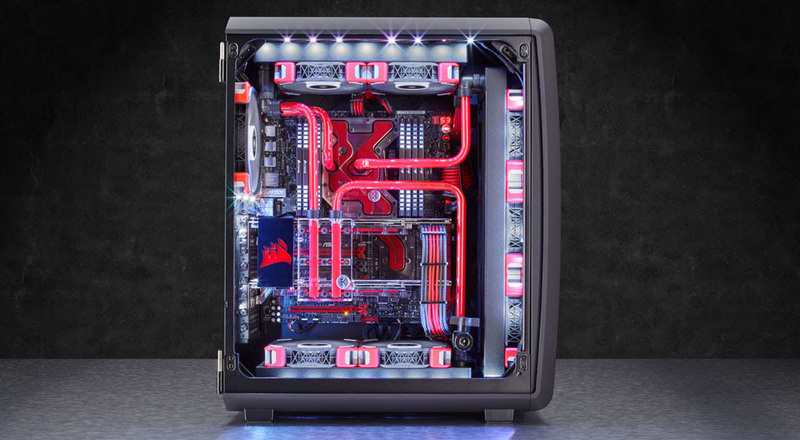 The main chamber houses the core heat generating system components; the motherboard, CPU, graphics cards and memory, while the rear chamber mounts the 3.5in/2.5in drive bays and the PSU. This arrangement maximizes the airflow from the three pre-installed CORSAIR AF140L 140mm fans, delivering amazing unimpeded airflow through the main compartment. Drive cages and cables are neatly tucked away and don’t interfere with airflow, all without compromising on storage capacity. The Air 740 takes the original Air 540’s dual-chamber concept even further with the removal of the 5.25in drive bays, allowing for a huge array of extreme system cooling options and up to eight 120mm cooling fans. The Air 740 can simultaneously mount a 240mm/280mm liquid cooling radiator in the roof, a 240mm/280mm radiator in the floor and a 240mm/280mm/360mm radiator in the front. What’s more, the Air 740’s enormous, hinged and fully removable side panel is perfect for showing off those amazing builds and setups, so your system can look as cool as it runs. Part of the joy of owning a custom-built PC is building it yourself and with a host of installation-friendly features, the Air 740’s guarantees an easy setup experience for all users. The three 3.5” or four 2.5” tool-less drive trays in the rear chamber allows simple storage swapping, removable dust filters makes maintenance a breeze and the fully removable windowed side panel allows for fast installations, easy upgrades and convenient hardware accessibility. With Air 740, CORSAIR started with the Air 540’s blueprint and elevated it to the next level, resulting in enhanced performance, improved design and phenomenal support for a wide-range of cooling options. Air 740 – Legendary performance redefined. Dual-chamber Direct Airflow Path™ design: Utilizes dual-chambers to deliver cooler air to your CPU, graphics cards, motherboard, memory, and other PCI-E components without your drives or power supply getting in the way. Industrial-style ergonomics and space-saving internal design: Offers massive internal volume by moving the power supply and drive bays into a separate chamber. Includes three custom Air Series AF140L intake and exhaust fans: Based on the award-winning AF140, the included fans provide great airflow performance at lower noise levels than typical case fans. Amazing cooling expansion room: For up to eight 120mm or seven 140mm fans, a 240mm/280mm top radiator, 240mm/280mm floor radiator, and 240/280/360mm front radiator – all at once. 8 x Expansion slots: Can house up to 4 graphics cards. I/O Port: 2 x USB 3.0, headphone and mic.